Nothing lame about this. Lindsey’s comment is a typical symptom of the American bubble. I’m surprised she didn’t assume her friend was visiting Vegas. ^ Nah, that picture would have been taken at night time. 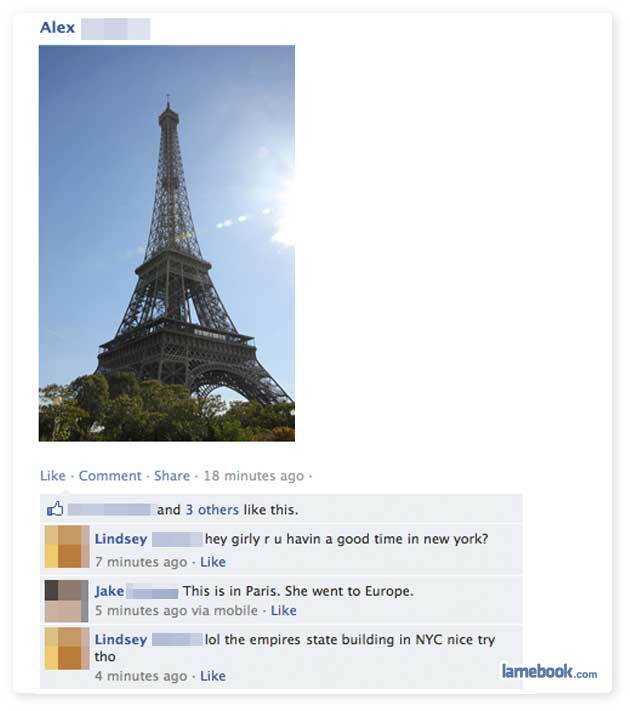 I fucked Lindsey in Paris, she should have known better. There is nothing here that proves Lindsey isn’t from Australia. Why are you powdering your toast instead of putting butter and powdered sugar on your French toast? jzimbert – silly Australian bints wouldn’t write “NYC”; they’d write New York or ‘Merica! ..and any aussie dumb enough not to recognise the Eiffel Tower probably wouldn’t of even heard of the empire state building. I refuse to believe she’s actually being serious.